Where to begin? I want to say, it was one of the most intense and wonderful events in my life – the first true WMC (Winter Music Conference) experience. My trip didn’t start smoothly. I ran late for my 6.00 am departure, only to find out that my flight got rescheduled and all passengers ended up bouncing from one plane to another for almost 6 hours. 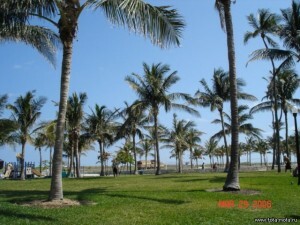 In the end, instead of arriving to Miami at 9 am and enjoying the sunny Florida weather, I reached my hotel at 4.30 pm. I was staying at the same hotel in the heart of SoBe as the year before (The Clay Hotel). My girlfriend, Laura, was arriving an hour later, which allowed me to take a brief walk along Ocean Drive and completely ruin my feet with new shoes. Thus, my trip started terribly but despite all, I was ready to have a great time. 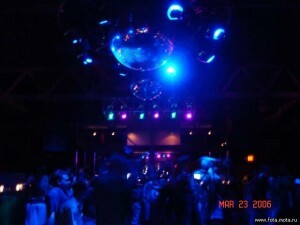 What can go wrong when WMC 2006 starts with the Armada Night at Space? Taking into consideration my previous bad experience with Space, Laura and I arrived to the Club at 9.30 pm. We collected our will-call tickets and went inside. Matthew Dekay was already spinning and people were gathering very quickly. After about 30 minutes, dance floor filled in. It was great to see so many familiar faces, many of whome came only for this ONE particular night. Pity that night sucked! Matthew Dekay was the highlight of the evening (can’t comment on Remy who spun in the very end, when I already left). MDK never manages to disappoint. He is young, talented and very creative. His part of the night brought me a great satisfaction. 3 hours of MDK was enough to make a night. Thanks a lot, Matthew! The rest of the night turned out to be a disaster. 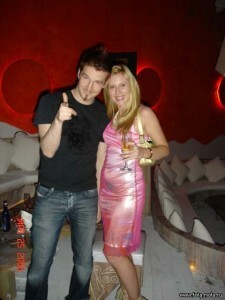 I don’t know why, but that night Markus Schulz imagined he was Armin van Buuren circa 2002. Armin van Buuren came next, but his set was very unremarkable and plain. Having been Armin’s biggest fan, I felt a bit dissapointed to hear him play such an undistinguished set. I left at 4.30 am, in the middle of his set and later found out I haven’t missed much. Laura and I woke up in different hotels. I have no idea where she spent a night at (in/with), but I woke up in the arms of Dimitri. Despite the failure of the Armada night, my day started off great. I went for a walk on the beach, got soaked in tropical rain and bought a bag of delicious cookies, all, before getting back to my hotel. 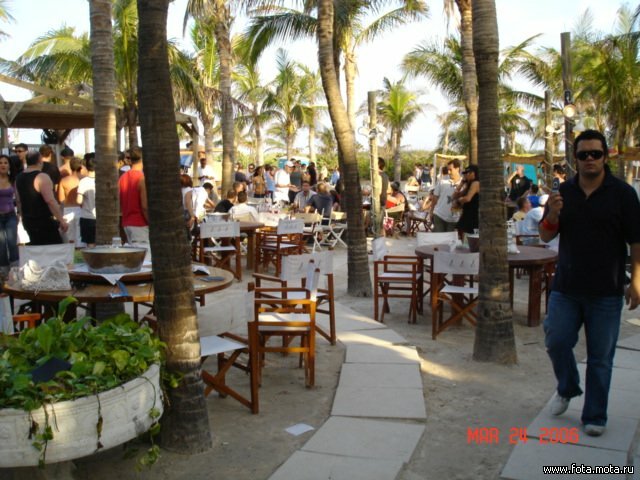 In the afternoon, Laura and I went to meet H&H (my friends from New Orleans – Herbert and Hong) at Cafeteria, and apparently it was a happening place, as on our way we met Darude, guys from Cosmic Gates, Ian, Jason Jollins and James Zabiela. Apparently, Miami is a place to be! Darude looked shocked to run into me again, but Zabiella was nice enough to give me me his UK phone number. 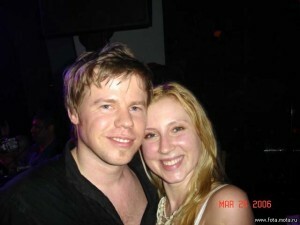 Laura and I didn’t have any big plans for Thursday, so we went to Crobar for Serge Devant, Junkie XL and Ferry Corsten. What a great night! Music was good, atmosphere was relaxing. Armada guys were hanging out in a VIP area on the first floor, some ‘other VIP” guests (in particular Del – the moderator of the www.tranceaddict.com) were partying on a second floor. Serge threw a very good set; in my opinion, he is a great representative of the EDM scene of New York City. Junkie XL was better then ever and looked more like a DJ than a usual show-man. I run into two girlfriends of mine, who were in Miami on vacation, and randomly ended up at Crobar that night. They fell in love with Junkie XL. Indeed, Tom is a different type of a DJ. He is not just a record-mixing machine, but a true personality, with his own world and a way to replicate and deliver that world to public. He was great! Dimitri was there too and made my night even better. I hung out downstairs with the Armada people, chatted with Matthew Dekay and his lovely girlfriend Helena, Ruud M. (a producer from Endemol), Remy and others. Later, i I got into a booth with Dimitri and Ferry Corsten and it was great to give Ferry a real hug, once again. We stayed till the very end, because it was worth it. Despite a fact that I have seen Ferry multiple times during his monthly residency at Crobar NYC, he always brings sparkles to his set. Either it’s a new tune or an old one, they all sound great when it comes to Ferry. I couldn’t have been more disappointed with the weather, it was raining for the rest of the weekend, nevertheless, I was looking forward to The Wet Grooves party at Nikki Beach. The venue was half empty when I got there at 2 pm. A new policy required from us to purchase a bottle of alcohol in order to get a lounge-chair. Wow, what if i don’t drink?! Accidentally, I ran into a friend of mine who happened to be one of the owners of Nikki Beach, so he took care of everything… chairs including. I got to see Filo and Peri‘s set, but because Laura and I were placing more bets on the evening DJ line-up, we decided to go back to the hotel and come back after sunset. We returned at 8 pm, just in time for BT and Above and Beyond on the ground floor. H&H and their friends arrived around 9.30 pm and after a few pitchers of Mojito, we went upstairs to see Darude, Andy Moor and Cosmic Gates. It was a very nicely decorated place with a huge ball hanging right from the middle of the ceiling. Music was great. In my humble opinion, Darude is a great Dj, who is grossly underestimated. I’m still waiting when people start appreciate his music the way it deserves to be appreciated. It was my first time seeing Andy Moor and Cosmic Gates. Great night overall! Day started with an attempt to hit a beach, but it was just too cold. I stopped by Dimitri’s hotel and he introduced me to Keith Flint ( OH MY GOD, if only I knew, he was from The Prodigy!) Well, it was something to discover later. Saturday was ultimately and exclusively dedicated to an Ultra party. I arrived to the venue with some friends, who couldn’t get inside. I met up with Herbert and after checking a few music tents, I settled by a main stage, expecting to see Paul Oakenfold, The Prodigy and Paul van Dyk. This year around, the organization of Ultra expected to be better. The sound went down in the middle of Oakey’s set, but as a true entertainer, he kept dancing with a crowd and entertaining it. Light went down in the middle of The Prodigy set, but everyone was so excited to see them that nobody paid attention to those little glitches. The Prodigy band was great (even though it’s not a type of music I enjoy listening to). PvD started bright and because I haven’t seen him in a while, I was amazed to see that he, in fact, finally learnt some dance moves. I left at 11.30 pm because .. there is no Ultra without Tiesto!!!! 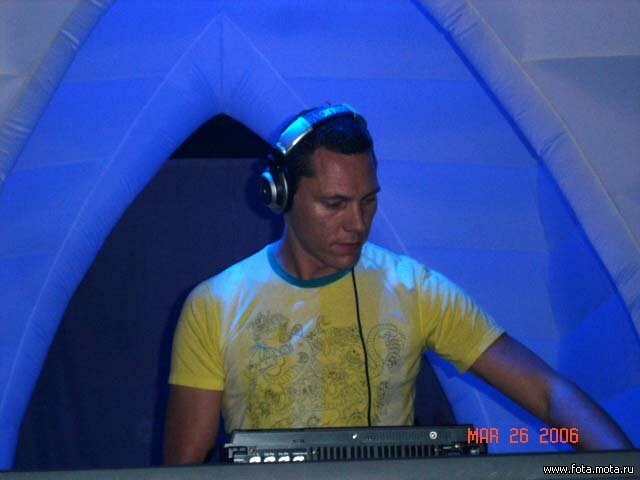 I was going back to the hotel to put my party dress on and hit the most exciting event of the night (by Invitations Only – Tiesto at Mansion. 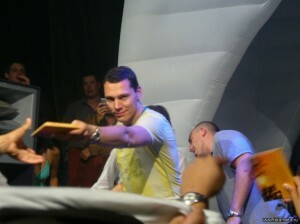 I want to thank Tiesto’s crew for the guest list and Karl R. for a VIP table right in front of a DJ booth. It was an amazing night. Hearing Tijs playing again, seeing my friends having fun, watching people happy faces .What can be better?! Better could be only Sunday night “In Search of Sunrise 5” release party! I was waiting for this day for more than a month. In late afternoon Laura and I stopped by Cafeteria to grab some food and check out Gabriel and Dresden‘s new album listening party, that took place in a back room of the restaurant. It was a pleasure to meet Josh and Dave and especially Dave Dresden’s mom. She rocked! But the main event of the night was a 7 hour set of Tiesto. He started at 10 pm, surprising everybody by playing behind a huge curtain. At midnight the curtain has dropped and the show has begun! I never looked at my watch throughout the night (which is sign of a tremendous success)! H&H and their friends had a table to the left from the stage with a great view of the DJ booth and dance floor. There is nothing better than party with happy people with similar music affiliations. 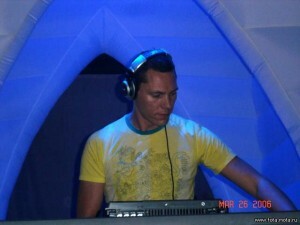 The more I heard “the sound of Tiesto” the more I crave it! It was a mind blowing night. Thanks Tijs for a great joy! Uncharacteristically, he stayed longer to sign the CDs, t-shirts, tickets, empty bottles of water, lingerie, shoes.. 😉 I bet he enjoyed that too! Party was over, but my body sought more fun. On the street, I ran into Richard Rockstar from Crobar NYC and he invited me to come to Nocturnal. We got to Nocturnal terrace shortly before 6 am and guess who was there? 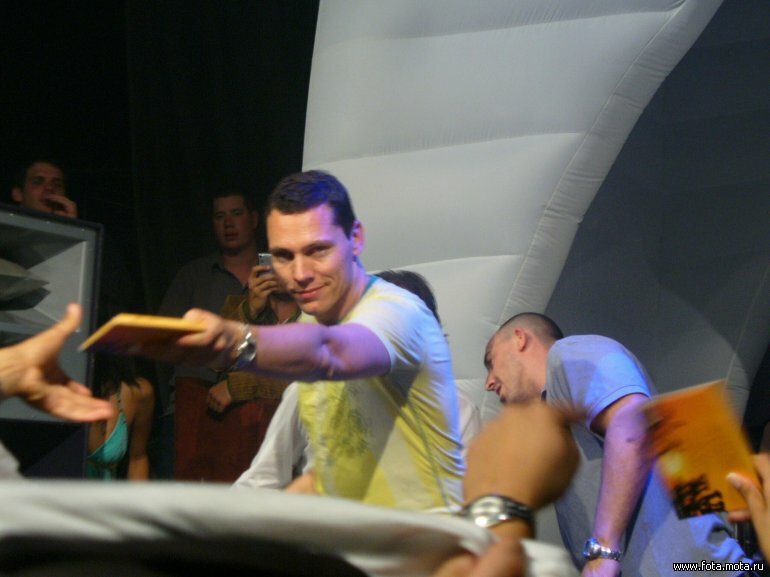 Everybody, who didn’t get enough of Tiesto and Dimitri too. I am still trying to replay in my mind that Monday morning – I was with Dimitri, dancing on the couch in a VIP area, listening to Svan Vath, sipping from two glasses simultaneously. Sun came out and it got suddenly warm. Dimitri was right behind me to catch, in case I fall (I wasn’t drunk but very very dizzy). I saw him smiling every time I turned my face to him and I think it was a moment when I realized how much he meant to me. We left at around 11 am, had a breakfast at Primetime cafe on Ocean Drive and went to the hotel. I fell asleep the moment my head touched a pillow. 3 hours of power nap and shortly after 5 pm I was heading to “We love New Orleans” party. Later my friends and I had a dinner at a Vietnamese restaurant. Tons of small portions shared by 6 friends. Yum! I didn’t plan anything for Monday night, overwhelming exhaustion forced me back to the hotel. Dimitri called after 2 am, when he finally completed all his music-business related meetings. Despite my tiredness, I got up and joined him at his hotel. It was our last night together, before we had to part our ways again. Dimitri and I had lunch at News Cafe and then sat by the pool. Noon, 1 pm… 2pm…. 3pm… It was time to leave and I had to let him go. It was so difficult. I was smiling but inside my heart was breaking. I knew he felt the same way, but he jumped into a car and left…..
Well, as for me, I still had another night to enjoy, before going back to cold NYC. Laura and I did some shopping on Lincoln Road and then I had a dinner with Karl R. at Setai Hotel (a glass of Krug Champagne is $65… gotta love this place). After the dinner, we went to B.E.D. for Matthew Dekay, Remy and Markus Schulz. I still can’t understand how my first and last nights got screwed up so badly, but this night sucked too. MDK was great, but his slot was no longer than an hour. I completely missed Remy, because his set was too short. Markus Schulz might be a nice guy (and I don’t want to take this from him), but his music isn’t my cup of tea. I literally fell asleep. Last day, last hours on a beach, last shopping. Laura was tired, I was exhausted but our trip were fulfilled. I got my dosage of fun, music and sun. I was going back to NYC carrying the best memories of that week with me. Laura! I want to thank you for being my party-mate, roommate and, most importantly, my friend! I truly enjoyed (and still enjoying) your company in Miami. We are a great team! H&H! You are my inspiration. You make me stick to true self. You are the most precious gift I have ever had. I love you, guys! LATA team, Joey, Helena, Ali, Mario, Jason Jollins, Arturo, Genna, Richard and everybody, who I met during WMC – thanks for great moments we shared together. Tijs team, Armada team, AM Only, Ferry Corsten, people from Ultra and MadeEvent – thanks a lot. And Dimitri. Is it a right time and place to admit that it’s something BIG!!! Ja tebja lublju, schatje! This entry was posted in United States of America and tagged Above and Beyond, Andy Moor, Armada, BED Miami, BT, Cafeteria, Clay Hotel, Club Mansion, Club Space, Cosmic Gate, Darude, Endemol, Ferry Corsten, Filo and Peri, Gabriel and Dresden, In Search of Sunrise, James Zabiela, Jason Jollins, Junkie XL, Keith Flint, Krug, Lincoln Road Miami, Markus Schulz, Matthew Dekay, Miami, News Cafe, Nikki Beach, Nocturnal nightclub, Paul van Dyk, Primetime Cafe Miami, Remy, Serge Devant, Setai, SoBe, South Beach, Space, Svan Vath, The Prodigy, Tiesto, Ultra, Ultra Music Festival, Wet Grooves, Winter Music Conference, WMC. Bookmark the permalink.